The great glory of the Master lay in his wonderful sympathy for everybody, especially for the ignorant and the poor. Some of his disciples were Brahmins. 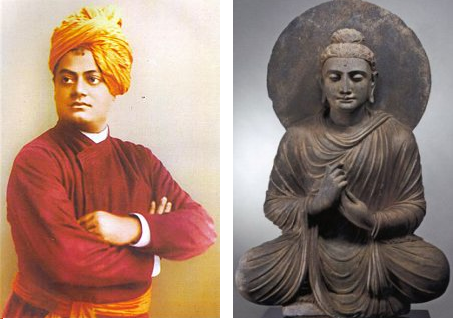 When Buddha was teaching, Sanskrit was no more the spoken language in India. It was then only in the books of the learned. Some of Buddha’s Brahmins disciples wanted to translate his teachings into Sanskrit, but he distinctly told them, “I am for the poor, for the people; let me speak in the tongue of the people.” And so to this day the great bulk of his teachings are in the vernacular of that day in India. I find that the symbol of Ganesh happens to be most popular among Americans. A coworker asked me to bring a small statue of Ganesh when I went to India last. He now keeps it on his mantlepiece at home. Faith in God is triggered by the ignorance about death and due to the weakness extending from it. I find the false data surrounding and promulgated about death to be the source of weakness and fear surrounding death. I can imagine healthier considerations toward death which could make a person impervious to fear of death. Written another way, we have to be fed nightmares about a torturous existence following death to make us worry enough to invent soul-insurance policies such as needing salvation. This is the earlier implant which creates weakness and all manner of victims. “As it is obvious from the above interpretation, a soul is what remains of the self after the removal of physical energies and forces. The soul does not have the same characteristics as the self. Soul does not behave the same way as the self did. I wonder what we’ll get when we look at both Hinduism and Buddhism together. Aren’t we doing just that on this blog with the help of our Western friends! And here I include Hubbard as one of the greatest among those Western friends.